Max Verstappen's 2017 woes continued with another disappointing retirement, this time from the Austrian Grand Prix. The Dutchman, a heavy favourite among the crowd, barely even made it to the first corner before retiring. A slow start, caused by a clutch problem, saw him drop down the order before being punted off the track when an out-of-control Daniil Kvyat - the man Verstappen replaced at Red Bull Racing last season - collided with Fernando Alonso's McLaren, and the pair collected Verstappen, sending him spinning. He tried to limp back to the pits but was told to stop the car before he could make it back. “We had a clutch issue at the start of the race," he said. "I could feel on the formation lap that it wasn’t great and then at the start it failed which triggered the anti-stall as I tried to launch. "I pulled away after losing many positions and tried to stay out of trouble in to turn one but I got hit on the rear tyre. Because of the hit the clutch over engaged, braking the bearing in the clutch, so I had no drive. "I also feel disappointed for all the Dutch fans as they have travelled a long way. I wanted to put on a show for them but I could not even complete one corner today." 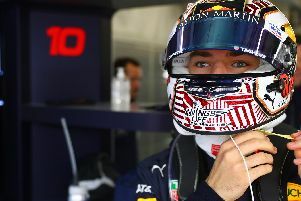 It is the fifth retirement in the last seven races for Verstappen, and third in a row - none of which have been his fault - but the 19-year-old isn't pointing the finger at his team. He said: "The boys are all working very hard and there is no blame on anyone, we have just had a lot of bad luck recently and I have to try and stay positive. "It’s definitely not nice at the moment and I’m very disappointed again but it’s also very important to keep pushing everyone forward as there are still many races to go. We just hope that the next race will be better."